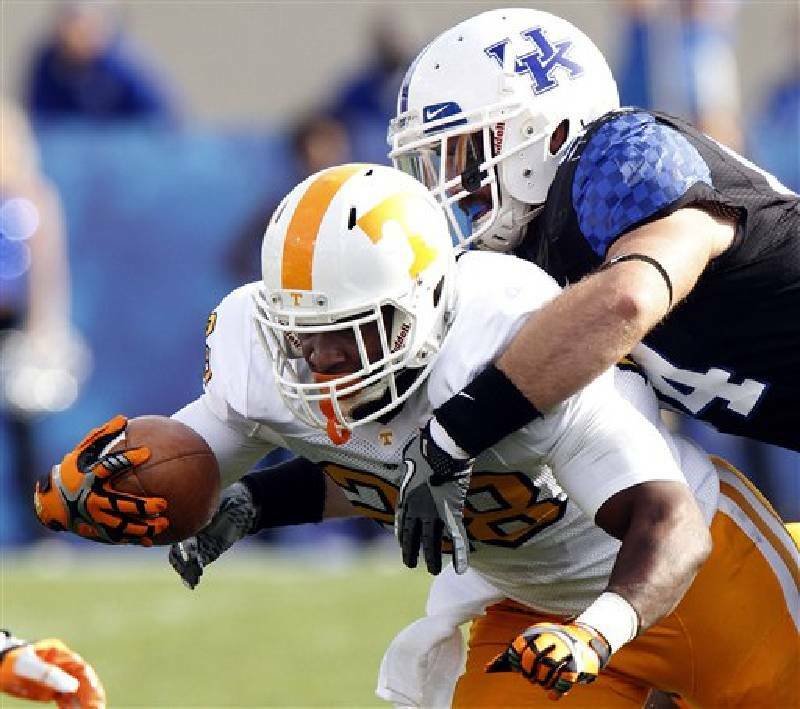 Tennessee's Tauren Poole is wrapped up by Kentucky's Taylor Wyndham during the second quarter of an NCAA college football game in Lexington, Ky., Saturday, Nov 26, 2011. LEXINGTON, Ky. -- One streak continued Saturday afternoon at Kentucky's Commonwealth Stadium. It certainly wasn't the one anyone -- especially the Tennessee Volunteers -- was expecting. With a wide receiver playing quarterback, the Wildcats ended a 26-year losing streak to the Vols with a surprising 10-7 win that will keep UT home for the bowl season and in the cellar of the Southeastern Conference's East Division. "What an amazing game," Kentucky coach Joker Phillips said. "Who would pick out Matt Roark as the [quarterback] who broke the streak?" It's the first time that Tennessee has lost seven SEC games in a football season. The Vols will miss a bowl game for the second time in four seasons and finish with a losing record for the fourth time in the last seven years. All of second-year UT coach Derek Dooley's 14 losses UT have come with the Vols tied or trailing at the half, but this was the most inexplicable. "Real bad ending to a real bad season, and it's hard to really say much more than that," Dooley said somberly. "Give Kentucky a lot of credit. They played a lot more inspired football than we did. Now we've got to begin our climb up, because I do believe at some point we were going to hit a place that wasn't good, and we were kind of headed in this direction all along. "We just couldn't fight our way out of it. Real disappointing, but we're going to have to learn from it and we're going to have to begin our climb in the offseason when we get back." Kentucky entered the game with both quarterbacks who have started games this season, Morgan Newton and Maxwell Smith, questionable. "We thought they might start out in a wildcat, but didn't know it was going to be the whole game," Dooley said. "We had to sit there and basically play wing-T football." Roark, a 6-foot-5 senior, hadn't played quarterback since his time at North Cobb High School in Acworth, Ga. The Wildcats turned back the clock with Roark running the offense, mixing in speed option plays with zone reads, quarterback sweeps, draws and bootlegs. Kentucky put together only two sustained drives, but that's all it needed. "He looked like he did in high school," Phillips said. "That's exactly what he looked like. Somebody said coming out we are either the smartest or the dumbest coaching staff for putting him back there. He did an amazing job." Roark completed four of his six passes for only 15 yards, but he ran 24 times for 124 yards, including a crucial 26-yard scamper on third-and-12 from the UT 33 on the third quarter's last play. UT linebacker Austin Johnson appeared to strip Roark, and Ben Martin recovered the ball for the Vols. The officials ruled on the field that the play was not a fumble. Dooley challenged the call, but the replay official upheld it. "I thought the ball was out and we recovered it," Dooley said. "I guess they ... I don't know. I challenged it and I said the ball was out, and they ruled that the ball wasn't out and they didn't overturn it. I don't know. They don't really give you an explanation when they don't overturn it." Two plays later, CoShik Williams, who chipped in 68 yards on 21 carries, scored from 6 yards out. When UT quarterback Tyler Bray hit Rajion Neal for a 53-yard score on the third play of the ensuing drive and nearly 13 minutes remaining, the noisy Commonwealth Stadium crowd got quieter, almost as if it was preparing for a similar script to the previous 26 meetings. Kentucky's defense bowed its collective neck as it had done all day, though. The Wildcats forced two three-and-outs, and Taiedo Smith sealed the win by intercepting Bray's desperation fourth-down pass with 1:27 on the clock and the Vols out of timeouts. "It's embarrassing," Bray said. "I don't know how many years it's been, but it's been a lot. To be the team that finally breaks [the streak] is really embarrassing." Bray, who Dooley said was sick nearly all week, completed just 15 of his 38 passes for 215 yards. Kentucky linebacker Ronnie Sneed picked him off in the first half. Neal had 125 yards receiving on four catches, but he had a fast snap in the wildcat formation go through his hands two plays after a 44-yard catch had given UT the ball at the Kentucky 8. "There's a lot of ways you can look at it," Dooley said, summing up his team's failed chance to go bowling. "Sometimes you don't get always what you want, but a lot of times you get what you deserve. We're not a good football team. We've got a lot of work that we need to do to be a good football team. We need to go to work at that. "Going to a bowl will make you think you better than you are. [It] probably wouldn't have helped us, when I look at it. We need to know that there's a lot of things you have to do to be a good player,W and there's a lot of things you have to do to be a good team, and we aren't doing what we need to do, so we don't deserve to get rewarded. That's just how it is."